24 villagers of assorted ages and ethnicities to fill out encounters in a globe-trotting fantasy campaign. These non-generic character portraits are the cure for "oh look, it's farmer Bob again" blues. Whether you're looking for a middle-eastern merchant to get that djinn-cursed vase into your character's hands, a farmer to send them hunting monsters, or need npcs to flesh out the lower rungs a cosmopolitan city, this pack has got you covered. Also included are handy facing indicators and faction / relationship identifiers, so you don't have to keep going back to the master world document every time to doublecheck which NPC is friendly (or more than unfriendly) towards the party or other political faction. 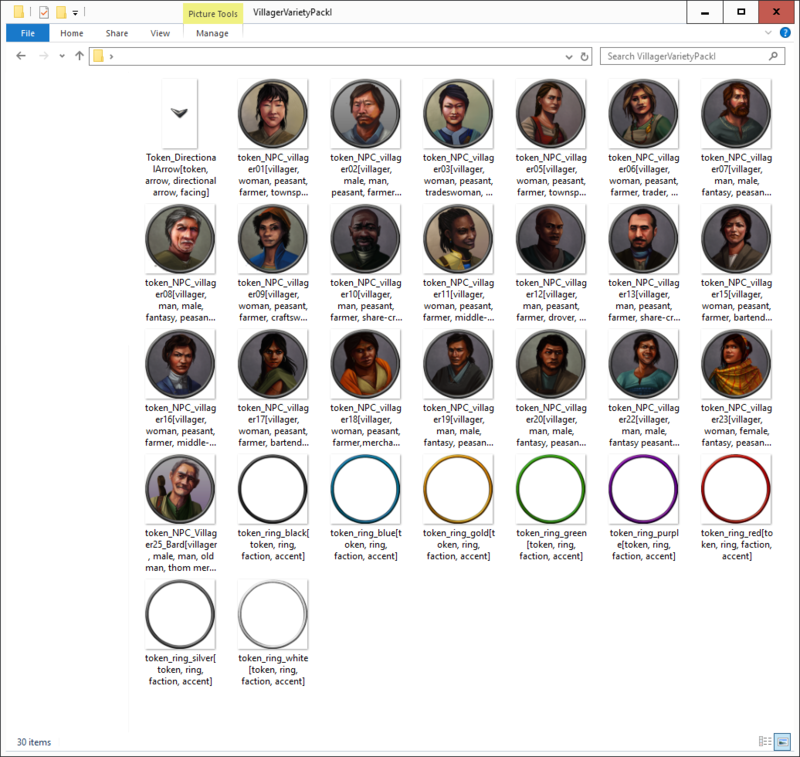 After purchase, you'll get a .zip file with all 30 individual character tokens, faction markers, and facing indicator, which are yours to mash together in your characters' travels as you see fit. The individual pieces are made to be easily drag-and-dropped directly to the virtual tabletop, or you can upload the contents of the zip to Roll20, where the tokens will quietly live in your library until you need them. Bonus feature for Roll20: The "Your Library" section of the DM tools can be unorganized at times, each filename contains the specific dimensions of each tile needed to maintain seamless integration and reduce headaches. Every file has unique tags built in to their names, so you can use built-in search features to find the right piece for the right spot. Can these images be used as stock art in adventures published on DTRPG/DMs Guild, or are they purely intended for use in VTT games?